Quite possibly the most energetic full-out dance picture we’ve seen in ages, Step Up 3D makes a laughingstock of last year’s uninspired Fame remake and reminds avid filmgoers just why we go to the movies. After the Angelina Jolie vehicle Salt, Step Up 3D is easily the most fun I’ve had at the movies so far during this lackluster summer where character driven indies keep stealing the thunder of big budget blockbusters, as these scrappy New York City dancers kick back with gusto, going to the mat for the Hollywood studios by delivering escapist fare of the highest order. So filled with creative choreography that the energy of the dancers pours out of the frame in such a way that cinematographer Ken Seng can barely keep everything in the lens as backup dancers spring forth like a fountain in every direction, Step Up 3D is elaborately executed with extravagant, eye-popping, entertaining sequences that continually top all those that we’d previously encountered. Essentially director Jon Chu’s third installment of the Step Up series is short on plot as the predictable, dubious screenplay doesn’t generate a single surprise, making it no wonder that it’s weakly acted by a large cast of appealing toe-tappers who are best expressing themselves with back-flips and break-dancing. However, it’s easily forgiven by the sheer ambitious scope and jaw-dropping power of the endlessly creative production numbers. Like an adventure movie, we’re basically just hanging in there until the next burst of action propels the work forward. 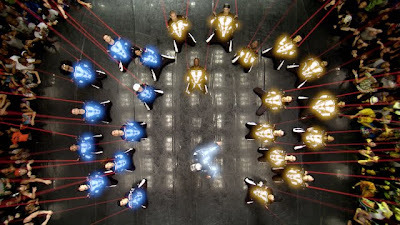 In doing so, we lose ourselves in what could be considered an extended series of innovative music videos as the film’s choreographers incorporate all styles of movement from classical tango to street dancing with nods to legends like Fred Astaire, Gene Kelly, Bob Fosse and Michael Jackson in between. Although I hadn’t seen the second work in the franchise and so I was unaware that two of the characters from Step Up 2 the Streets were reprising their roles in Chu’s second directorial effort in the series, since the main focus is all about the beat of the streets, the film plays just as successfully for those familiar with the elements of the previous movies as it does to those just strolling in unaware. Obviously I have no idea if the movie will wind up premiering on DVD and Blu-ray in 3D or not since Touchstone’s parent company of Walt Disney Home Entertainment is notorious for releasing previously three dimensional works in a 2D disc format. Therefore I can’t stress how vital it is to catch this movie not only in the theatre but also in 3D to fully appreciate just how much effort went into ensuring an unparalleled visceral experience where dancers seem to journey off the screen, pulling you towards them as if inviting you to join the celebration regardless of where you’re sitting. Virtually an exploratory near-IMAX voyage of just what can be achieved with 3D technology, the movie manages to maximize the potential of the medium with eye-candy galore as bubbles pop before your eyes, a car drives towards us while taking in Time Square, water splashes our direction, dancers glow in the dark, and an Icee spirals around in the wind. Likewise, the West Side Story infused rivalry and confrontations between the two best dance groups never really feels authentic as Luke recruits not only Moose but also his obvious love interest – the beautiful Natalie (Sharni Vinson) – to compete at a world dance competition to save their warehouse living space courtesy of the one hundred grand cash prize. However, despite the fact that we see one of the biggest twists concerning Natalie’s character coming a mile away or in fact within the first ten minutes she’s onscreen given an obvious editing mistake that focuses a second too long on another individual, since above all we’re not all that invested into the movie on a sudsy soap opera level, we have no problem ignoring the one-dimensional plotline to focus instead on the bravura three dimensional presentation. Needless to say, from Footloose to Dirty Dancing to Flashdance to Save the Last Dance the genre isn’t exactly known for their particularly Earth-shattering plots and regardless of the fact that Step Up 3D is no exception, it manages to capture the same breathtaking feeling of those earlier movies and after overlooking the synthetic plot contrivances, we just can’t help getting wrapped up in the rhythmic beauty of human movement perfectly captured on film.